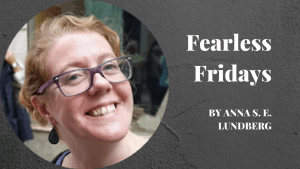 It’s time for another Fearless Fridays interview, and this one is with Sandra Henriques Gajjar. Sandra and I crossed paths at the Web Summit in Lisbon last November but it was such a huge event that we never managed to connect in person. Luckily we did connect via the app and we managed to have a Skype call so that I could get her story for you! Like many people I’ve spoken to, Sandra took a “temporary” job straight out of university and then ended up staying there much longer than she had planned. She remembered that she had always wanted to be a writer… and, well, you can read the rest below! Sandra brings up some really important points as she tells her personal story. She laments the common belief that a job is meant to be hard work, that it can’t possibly be something that you’re good at and you actually enjoy! She also shares the reality that the life of a freelancer can at times be tough, and that there is no such thing as an overnight success; you’ll have to work out if it’s something that you’re willing to take on. Read on or watch the full interview below to find out how Sandra is getting on, and to get more of her advice for aspiring writers. Sandra Henriques began her career in a temporary role in a call centre back in 2004, straight out of university. She stayed for seven years in this job, which paid the bills but for which she felt no passion, and in 2014 she decided to leave and start writing. She set up a blog and gradually started taking on different freelance writing jobs. Today that’s how she makes her living. I started as a call centre operator, taking calls, then two or three years later I became a team leader – a junior management position with higher pay and higher responsibility. I thought, this was it, and the first few months were amazing! But I couldn’t connect to what I was doing and I kept thinking back to myself at age 15 or 16, and what I wanted to be when I grew up – and it was always a writer. During one training session, the coach told us to give an answer without thinking and asked me: what would you be doing right now if it wasn’t for this job? And without thinking I said: travel writing. But it was almost five years later when I actually figured it out and decided to leave! I had always written, although I didn’t publish it – I always had notebooks and different blogs (that are no longer online, thank god!). The decision to quit, though, was sudden: I decided one day that I can’t do this anymore, I really don’t feel connected, I will never be able to adapt to the company – because you have to adapt, they’re not going to adapt to you – and I hate being told what to do! I started the travel blogging, and I thought: this will never go anywhere, and then within one year I was writing for Lonely Planet! I love to work from home! When I had a normal corporate job and I had to wake up at 6am to go to work, I hated it; and now I wake up at 6am, I start writing and I write straight for three hours – and my work is done for the day! That’s the good part. The bad part is: freelancing is hard. I have two or three clients who are steady clients, that I can rely on for work, but some months are tougher than others. I have to learn to not worry about that. Learning to let go is the hardest thing – I don’t think I’ve mastered it yet but I’m getting better! You have to ask yourself: can I live like this? Do I have a partner who works and can help me out with bills? Not everyone has the energy to go through with this. It also takes a lot of outside validation, like the imposter syndrome that people talk about. I got support from my family. I got “good vibe” support from my best friend, who is also a life coach – she’s always been coaching me on the side! Every time I was freaking out about something, she would talk to me and calm me down. I also write a lot on the side of the actual writing and I always tell people to have a notebook and write all the crazy ideas you have and all the things that went wrong; I always do this. It’s not a “dear diary” kind of journal but many times when I feel like, “I can’t do this, this is not working, I should stop immediately…” I take that notebook, I go back, and I see where I was two months ago, or two weeks ago, and I see: “this is how far you’ve come”… so two more steps! It’s not a financial support, but an emotional support that people need a lot. My son is about to turn 18 and that’s the kind of thing that I try to get him to see, that he can actually do anything he wants – if he has the skill! You could want to be a painter but not be good at it – but if you have the skill, then fine. Don’t let society tell you that that’s not a real job, that’s not a real career, it will be very difficult… Just find a way that you can actually work through it. I get to talk to a lot of people – that’s the good part, that was always my favourite part of travelling. I’ve had situations where I’m supposed to be looking at a landmark and I’m actually talking to the owner of the café across the street! I have a blog post that I wrote: I was doing research for my book at the time, and I was visiting lots of museums, which is actually quite boring, and I started chatting with the employees and I learned many different things about their lives, and how they connect to people, and how passionate they are about the things they do – and that’s really important. If you work in the travel industry and you’re not passionate about what you do, it’s not going to work, people are not going to feel that vibe. Right now, I’m not travelling as much as I want to. I started getting lots of freelance work and I couldn’t just pack up my bags and leave, I needed to pause for a while; but ultimately the people I meet and the stories I get to tell is the important part. Don’t listen to others! This is the first thing. In the beginning, when I started, I actually had to go back to my old blog posts and rewrite them to fit “me”. 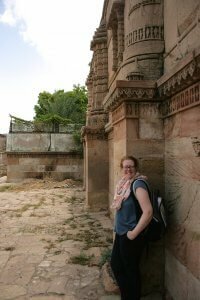 I think I was comparing myself to everyone else out there – people are writing about solo travel, so maybe I should be writing about solo travel… but, no, wait, that’s not what I do, I don’t always travel solo. And the first thing you need to do is find your voice and don’t be afraid if 50 people are telling you, “no, this is not what people want to read”. You don’t know that! Readers will come to you. 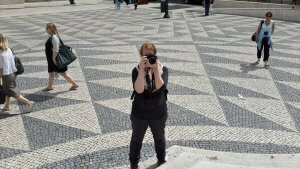 Most of my readers will come to me because they know they can come to me, if they want tips on Lisbon or the Azores; they’ll ask someone, and that person will say, oh, Sandra is your person! I think it also comes with age; I don’t think in my twenties I would be so sure that this is my voice and this is what I want to do, and I don’t care what the world tells me! But that is the most important thing: you need to have your personality. People need to read a piece that you wrote – even if you’re ghost writing it – and they have to have that feeling, that “I know this person, I’m pretty sure this person wrote this”… Otherwise it’s not worth it. Also don’t be afraid to write for free, in the beginning. You need to get yourself out there, people need to know you, and you start adding those things to your portfolio. It starts growing and people start paying attention to you. 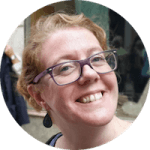 You can find Sandra’s blog here and her first article for the Lonely Planet here. Have you made big changes in your life and want to inspire others to do the same? Or maybe you’re 100% happy staying put where you are and want to make a case for being satisfied with what you have? Get in touch to share your story!